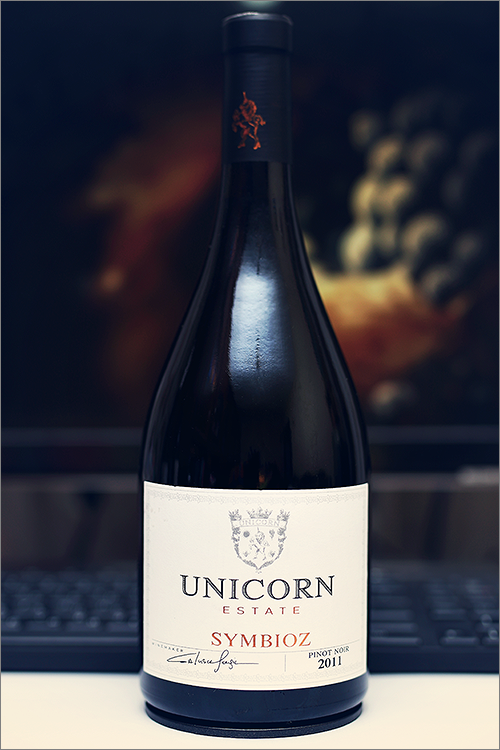 Tonight we are going to review a rare wine – Symbioz Pinot Noir 2011 from Unicorn Estate. This is a wine that was sold out almost instantly, partly due to the grape variety – pinot noir – the most difficult grape to grow, therefore the most difficult wine to make. Last but not least, what makes this pinot noir wine special, is the fact that it was aged in oak barrels, made from local oak wood, for 36 months. Quite impressive, but let’s move on with the tasting and find out just how good this wine is. Quite deep and ripe pomegranate garnet color, with shades of pale ruby towards the rim of the glass. The nose is strong, filled mostly with black fruits flavours: blackcurrant, black cherry, blue plum, sour cherry, plum jam and black raspberry. An instant later the nose is filled with notes of cinnamon, nutmeg, red pepper, roasted wood, tobacco and some subtle hints of truffles. The wine is medium-dry, with high alcohol level, high acidity and ripe tannin. It tastes ripe and seedy, with a nuanced oaky-woody accent – a clear hint that the wine was overaged. This is a quite bold, firm and complex pinot noir wine, with overwhelming smokiness and spiciness. The wine has a fair overall balance, but the barrique clearly dominates over the fruit in this one. It has a medium finish and an balanced, bitter-seedy aftertaste. This is definitely a great Wine of Moldova and the overall rating says the same, with 90.3 points scored it is right there, among the best wines we’ve tasted so far. Please click on the chart icon on the left in order to get to the wine rating page, where you can find all the wines we’ve tasted to date. Conclusion: this is a wine in its prime form, one that can age for another 2 or 3 years, but this is not a typical pinot noir wine, as the woody notes that comes from the oak-ageing are clearly overwhelming the fruit flavours from the grapes. It may sound a bit anathemic, still, the wine feels elegant and muscular at the same time. We would highly recommend to pair this wine with meat dishes with overwhelming spiciness, like for example a pepper-crusted filet mignon steak or a grilled T-bone steak. Enjoy!